This album is an offering to the Adiyogi on the occasion of Guru Purnima, recognizing him as a yogi, a guru, a being beyond qualities who defies all definition. 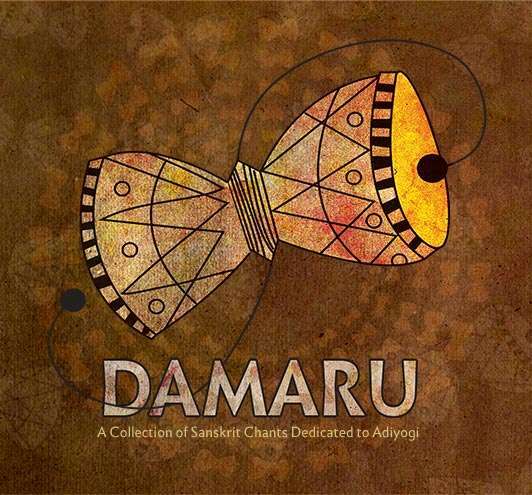 We hope Damaru resonates with you and awakens within every seeker the passion for the Ultimate. This song is a salutation to Adiyogi, the first yogi, who is beyond any one quality, who has conquered the five elements. We bow down to the first Guru who transmitted the science of yoga through the Saptarishis. Chandrashekara Ashtakam is said to have been written by Sage Markandeya.It is said that at the age of sixteen, Markandeya was saved by Shiva from the God of Death (Kala or Yama). In these verses, Markandeya seeks refuge in Shiva, referred to here as Chandrashekara (the one who wears the crescent moon on his head). “When He is by my side, what can Yama do to me?” he proclaims. This song is a descriptive salutation of the different attributes of Shiva. The great yogi who is referred to, as ardhanarishwara(who has included the feminine as a part of himself), the fair- bodied one, and who beats a steady rhythm on his damaru. Originally penned by Sadhguru in English before the consecration of the Yogeshwar Linga, these verses have been translated into Sanskrit. They talk about the mysterious and crafty ways of the formless Divine who shows the way to stillness and fulfilment, who is not the way but the end. The yogic traditions recognized the dualities of life – masculine and feminine, logical and intuitive, creator and creation, purusha and praktriti, Shiva and Shakti. On the surface, the Uma Maheshwara Stotram by Adi Shankara is a salutation to Shiva and his consort Parvati. On a deeper level it celebrates the two fundamental dimensions of existence. This Ashtakam is a chant of salutations to Shiva, “the consort of Parvati”. It describes the various attributes of Shiva who is exhorted by the sages and the Vedas and who is also known as the Lord of Blessings, who is attributed contradicting descriptions likening him to devils and ghosts as well as the most beautiful being. Embodying all the qualities of existence, he is all-embracing and inclusive – as life naturally is.